I love drilling back into foundational texts and discovering the complexity that made them into foundational texts. For instance, it’s really funny to read all the ‘radical’ retellings of The Iliad that are like, “The Greeks are a bunch of barbarians! The Trojans were civilized and wonderful!” and then go back into The Iliad and realize, wait…that’s already right there in the text. The whole book is suffused with a sense of sorrow about the doom that’s going to overtake Troy. And there’s also a serious sense of judgement that gets leveled at Achilles, in particular, for his pettiness and moodiness. It’s like The Merchant Of Venice. It’s an undeniably anti-Semitic play. But there’s still a raw power in Shylock’s sense of grievance–a power that prevents you, four centuries later, from dismissing the work. People have trouble with that. They think a work needs to be all one thing or all the other. Either it’s anti-Semitic or Shylock is a complex character. But both things are true. He’s a character who has risen beyond and surpassed his author. 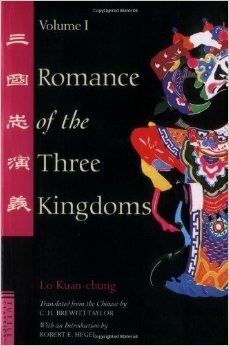 I’m finding much the same thing in Romance of the Three Kingdoms. There’s a definite viewpoint here. Liu Pei is the hero. He’s the noble one. He’s the true descendent of the Hans, and he’s the only legitimate Emperor. But it’s also possible to read the book another way! For instance, there’s a crime that lies right in the heart of the book. Liu Pei is penniless and defeated, and he goes to the court of his cousin, Liu Chang, with, more or less, the intention of stealing the man’s kingdom. Oh, he tries to deny to himself that he’s doing it. He tries to say he’s a reasonable man and that he’s only acting on the basis of prior provocation. But in truth he’s crossed a line. There’s deniability here, of course. The other man also plots against Liu Pei (to a limited extent). You can say that this is the nature of their disordered world. Strength wins out. A weak man can’t be expected to keep his throne. In fact, it does a disservice to the people to allow a weak ruler to remain in power. But…that’s also the viewpoint that Liu Pei struggles against. He believes that the Han Dynasty is meant to rule, and his whole career is based on opposing the usurper Ts’ao Ts’ao. So where does that leave us? In a very complex place. A very, very complex place. And that’s why we still read this book. Is anyone offended by the phrase ‘witch hunt’?